Joe Jets Diner…just what Chiang Mai needed! Recently, while in Bali, my partner and I discovered an American-style diner, at which point it dawned on us that a diner is exactly what Chiang Mai has been missing. No longer! On our return, we found out about Joe Jets Diner. 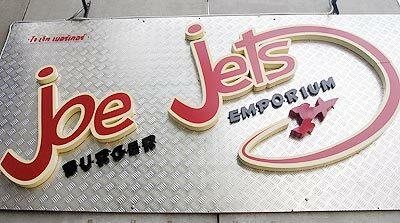 Joe Jets opened its doors on Huay Kaew Road almost a month ago. The inspiration of friendly owners, Allan and Daao, (often found chatting with customers), the diner is a work of art in itself. Its unique interior, resembling an airport lounge, is complete with red vinyl booths, old fashioned tube TV’s at each table, and framed pictures of bizarre, jet-propelled vehicles lining the walls The waitstaff are flanked in retro-tailored outfits, resembling flight stewardesses from another era. I found all the usual diner fare at this hip and fun family restaurant, including juicy burgers grilled to perfection, served on a grilled sesame bun. I “built my own” burger from one of the sheets provided at the back of the menu, the front cover of which is designed like a giant EU passport. A choice of three sizes of burgers, and an unparalleled list of toppings, including everything from the typical sauteed onions and mushrooms to grilled pineapple, black olives and smoked bacon, made certain my very own burger would be interesting. The fries, a staple of every diner in the world, were nothing less than perfect—hand-cut Chiang Mai potatoes, fried to a crispy golden brown, offering a choice of British-style vinegar, or American-style ketchup on each table. I chased them down with a thick chocolate shake - so large, I not only got the custom-printed glass filled to the brim, (with a very cool metal straw-spoon), but also the remnants that were left over in the silver blending cup! My friend had the banana shake, and swore you couldn’t go wrong with that choice. We ended our ‘burger journey’ with a slice of Blueberry Cheesecake, made in-house. It was divine - rich cream cheese filling on an Oreo crust, smothered in blueberry sauce. At the end of our third course of nostalgic diner food, Joe Jets provided us with free entertainment, a magician, Nick W. Daao told us that she would like to give Joe Jets a family atmosphere—she looks forward to providing free entertainment for kids and adults every Sunday for the next several weeks. She and Allan are also happy to organize birthday parties. As we were departing, I viewed a vast breakfast menu, which is still expanding. The prices are very reasonable, as Joe Jets hopes to accommodate local university students. Hours are 10am-10pm and delivery is available from www.mealsonwheels4u.com, where you can also take a peek at the menu. Joe Jets is at 237/1 Huay Kaew Road, just past the Canal intersection on the left side of the street while heading toward the mountain. Mediterranean cuisine is very popular at present, and this is a very simple recipe using the readily available Plakapong fish in Thailand, but any white meat fish will be fine. Frozen fillets can also be used, but leave them out for some time to make sure they are fully defrosted. The coriander garnish can be omitted if your guests are not used to this Asian flavor. Put a very little cooking oil in the wok and heat over medium heat until hot. Add onion and garlic and sauté until onion is transparent. Add tomato, white wine and oregano and cook until water evaporates, stirring occasionally. Place fish filets in a baking dish coated with nonstick cooking spray. Top with garlic/tomato/oregano mixture and bake uncovered at 350 degrees for 15 minutes or until fish flakes easily with a fork. Sprinkle with Feta cheese and olives and garnish with chopped coriander leaf. Serve with boiled potato or rice.